Ready-to-eat cereal also known as breakfast cereal has become increasingly popular in urban households. The food itself is an American invention and without a doubt, it is convenient and tasty, but is it as healthy as the claim made in the advertisements? Let us search breakfast cereal nutrition facts. Initially, cereal was invented as a digestive aid. John Harvey Kellog, the pioneer of modern-day cereal combined wheat flour, cornmeal and oatmeal into ready-to-eat cereal shapes and sizes. Between 1910 and 1925 sugar consumption doubled in the cereal. By 1930s fiber was eliminated from the cereal to make it softer. Regardless of the marketing hype, the popular cereal is a sugary snack. It is loaded with simple carbs and has negligible protein, which makes it poorly qualified to enter the list of healthy foods. Believe it or not, but cereals are largely responsible for destroying your fitness goals. Most commercially available cereals in the market carry tall and often misleading claims, ?like low-fat? on the box. The fact of the matter is that these cereals have small amounts of whole grains in them. A close look at the ingredient list shows the truth behind the tall claims made in the advertisements of the popular cereals in the market. Added sugar is the single worst ingredient in the modern diet. Interestingly, breakfast cereals are some of the most commonly consumed processed foods that are high in added sugars. In fact, in most popular cereals it is the second or third ingredient. Starting your day with a sugar-laden cereal will spike your blood sugar and raise your insulin level followed by a crash, and your body will need another sugar surge to tide over the energy slump, thus creating a vicious cycle of overeating. High consumption of sugar may also increase the risk of type 2 diabetes, heart disease and cancer. Protein is more satisfying than carbs. A research study has established that a breakfast of eggs in comparison to a breakfast of bagels is more satisfying and reduces later food cravings. The point to note is that both bagel and eggs have equal calories. A new study shows that eating loads of protein at breakfast, 35g or more can reduce mindless snacking and help control appetite throughout the day. In this study, the scientists found that after a high-protein meal, there was a significant drop in ghrelin (a hunger-stimulating hormone) and an elevation in PYY (a satiety-stimulating hormone). Whole grains are rich in nutrients and fiber and on the label of the cereal they are usually listed with the word 'whole' preceding the particular grain. Whole grains contain high amounts of many nutrients, such as B-vitamins, fiber, iron, magnesium, phosphorus and selenium. On the contrary, refined grains do not contain fiber, vitamins and minerals. Long-term studies have also shown that eating refined carbs lead to an increase in waist circumference and belly fat. These two symptoms have to be taken seriously because they can predispose a person to diabetes and heart disease. Furthermore, refined carbs may cause inflammation in the body. Several experts have speculated that this may be one of the primary dietary causes of leptin resistance and obesity. According to WHO, you should limit yourself to 26 grams of sugar a day. Sugary cereals add a lot of unnecessary sugar in your meals. Read the label carefully before you scoop it in the bowl. The sugar content should not be more than 5g. 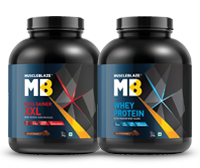 Fewer the number better it is like, MuscleBlaze High Protein Cereal has no added sugar. Most popular cereals are extremely low on protein, which sets you up for weight gain in the long run. For an average male the protein need runs between 56g and for a woman it is 46g. A protein-packed cereal like MuscleBlaze High Protein Cereal provides 17g protein in a serving. Fiber is required to keep you full and sated. It also controls insulin surge. An average male needs 38g fiber in a day and for a woman the fiber requirement is 25g. A cereal with 3g of fiber in a serving should be your baseline when choosing a healthy cereal. The point to note is that even the bestselling cornflakes brand provides only 1g of fiber in a serving, MuscleBlaze High Protein Cereal offers 4.5g fiber in a serving. If you want to make it healthier add chopped fruits and nuts in it to make it more fiber-rich. The very fact that your cereal lacks fiber proves that it is loaded with refined carbs. From your grandma's days, oats, whole wheat, soy have been considered healthy breakfast cereals. This holds true even today. Go for a cereal that has a mix of complex carbs derived from whole wheat, oats and soy. 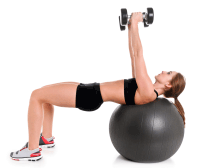 Such complex carbs will provide sustained energy and you will not suffer from energy slump. Cereals have moved beyond breakfast. They are the perfect anytime snack. Convenient and delicious they fill two necessary parameters of the modern lifestyle. The third aspect on which most cereals fall flat is nutrition. Not any longer, because MuscleBlaze High Protein Cereal easily meets your nutritional goal. 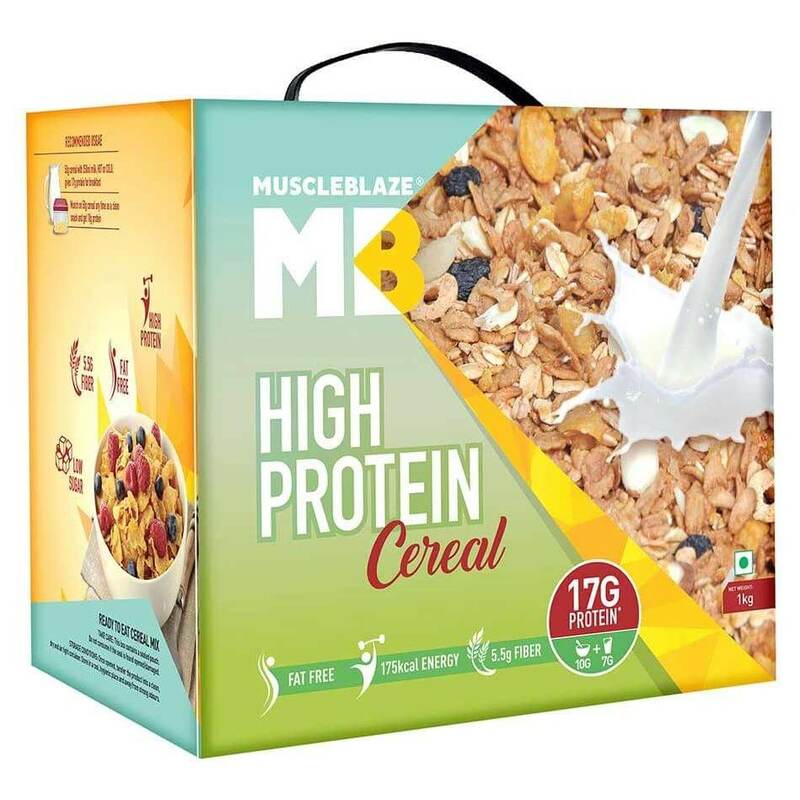 Unlike the imported virtuous cereals that almost break your budget, MuscleBlaze High Protein Cereal is extremely affordable and highly nutritious. Get it home today and stick to the fitness goal that you have set for yourself in 2017.